I love when people send me notes asking for advice about food choices, or how to find safety information about products, or WHAT IS A GMO ANYWAY? I have done endless hours of research on these topics, and when I don’t know the answer, I actually enjoy finding the answers for myself. It seems you can find information to support just about any belief these days. To juice or not juice? To eat meat or not eat meat? Paleo or Gluten free? RAW MILK OMG!! It’s exhausting, right? And so, I choose to do research until I find sufficient information from multiple trusted sources, along with my own knowledge of the world, some skepticism and common sense, and lastly, my heart. I LOVE talking about this stuff, but generally I keep my opinions to myself unless asked for advice (or provoked by my brother in law – HA!). So don’t be afraid to ask me questions – and I will give you my humble (but usually well-researched) opinion. This quote says it all. 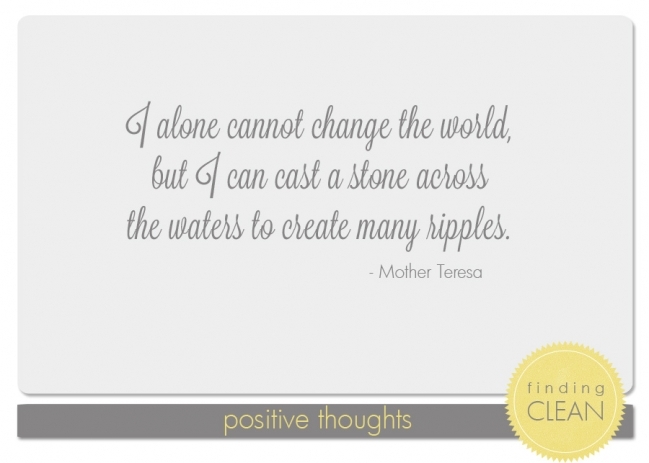 I’m not trying to change the world alone, just hoping to make a few ripples for people to notice.